Because their mom’s a storyteller by trade, my kids have learned there are a myriad of ways a tale can be shared. The four of us enjoy a play or musical together as often as we can. Visiting a theatre is also a wonderful excuse to dress up in a time when casual has become so common, and a great way for our children to practice social skills and manners like silence, patience, and offering praise for a performance. Studies show trips to a live show enhance language and literary skills, tolerance, and empathy toward others. If you are considering taking your child to a live performance, there are some things to keep in mind. Your child’s age and maturity level are, of course, at the top of the list. Most kids are ready to see a short performance by age three or four. And some can handle it earlier. 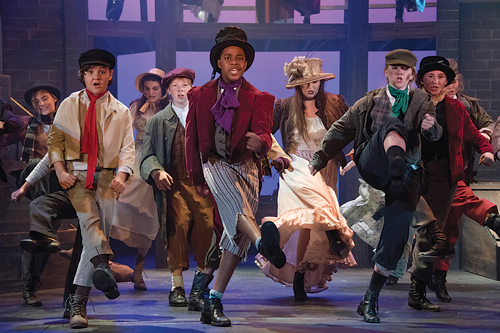 “The earlier you start, the stronger your kids’ appreciation for the arts will be,” says Vickie L. Scallion, founding member and executive/artistic director of HATTheatre, a production company in Richmond’s West End. While most of its shows are for adults, HATTheatre also offers a series of shows for families and kids. Scallion suggests parents stay mindful of a show’s content and length. Toddlers and preschoolers have short attention spans, and would most likely be able to sit still for a production that lasts about an hour. Make sure tummies are full and bladders are empty before finding your seats. “There is also a lot of waiting in the theatre, so bring something for them to do, maybe a book to read,” Scallion adds. This is where I will stress the importance of bringing quiet activities for the kids, like activity books, dolls, or stuffed animal friends. Also, you might want to leave your cell phone in the car to model appropriate theatre behavior for your kids. Scallion was seven years old when she went to see her first show, a high school play featuring her older brother. She started her own two children on theatre fairly young; their first Broadway show was Cats at ages four and seven. Going to the theatre teaches children how to focus, listen, sit still, and use an inside voice. Children also learn how to better use their imaginations and appreciate different characters and storylines, all skills that will help them not only in their educational pursuits, but later in life. Experiencing a play also enables audiences to connect to humanity in a way no other art form can. Sharing such a close, personal space gives you an opportunity to feel the same emotions with the actors, as if you and your family were right there with them, crying and laughing and identifying with the characters. “It’s important that children have that opportunity to be transported into the imaginary world being created, to experience the feeling of being part of the lives being brought to life onstage,” says Scallion. HATTheatre in Richmond’s West End stages shows for families with kids. 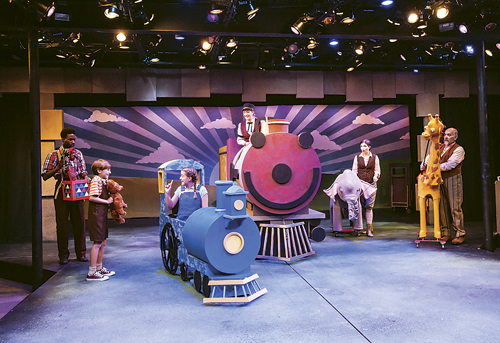 Production companies that specialize in children’s theatre know the attention spans of young audience members, so their shows are within the appropriate timeframe, and include stories and special effects that keep the young ones engaged. Joanna Bialet, a Richmond mother of two, can attest to that. 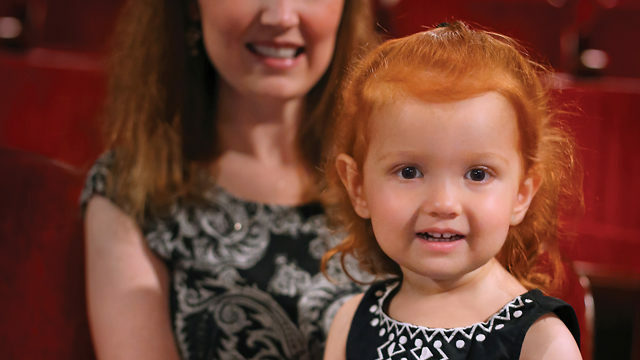 She took her older daughter to her first live performance at the Virginia Rep’s Children’s Theatre at Willow Lawn the week she turned two. Ryan Ripperton, executive director of the School of the Performing Arts in the Richmond Community (SPARC), started one of his children on theatre at age two, while the other was ready at age five. I agree with Ripperton. Children’s literature and familiar stories – especially when they’re explored at home in advance – help kids connect to what’s happening onstage and enhance your child’s experience. For example, Bialet and her daughter enjoyed the original musical adaptation of the classic children’s book, The Little Engine That Could, a few months ago. Upcoming plays that also sprang from books include Akeelah and the Bee, Pinkalicious, and Knuffle Bunny – all showing at Virginia Rep’s Children’s Theatre during the company’s 2017-18 season. Bialet plans to continue taking her daughter to the theatre as she grows older. She believes the experience can be a nice respite from the busy-ness of daily life and our technological world. SPARC shows have delighted kid-filled audiences since 1981. Bruce Miller is the founding producer of Virginia Repertory Theatre. He has spent forty-two years working in the world of theatre, and launched the first professional children’s theatre in Virginia, Theatre IV, in 1975. Since Miller and his wife, Terrie Powers, a set designer with Virginia Repertory Theatre, both made careers in theatre, their two children essentially grew up backstage. However, the couple did not take their children to see their first shows until they were both about three years old. Miller points out that many children aren’t developmentally ready to take in the narrative of a play until age four, but he encourages moms and dads to take their children to a theatre earlier than that if they feel comfortable. This gives toddlers an opportunity to get used to the lights, colors, sounds, music, movement, and other activity on a stage so those elements don’t become a distraction when children are able to appreciate the story of a play. Like Bialet, Miller views the enhancement of language skills as one of the more valuable benefits for children attending plays. He recommends that parents talk to their kids about the story, both before and after a play, and don’t shy away from a topic if the content of a performance makes them uneasy. As children grow older and experience shows with more mature themes, they may have questions, which allows for teachable moments for families. Ripperton feels the same way. Everyone I talked to stressed the concrete opportunities for growth that kids experience when they see live theatre – most notably, a chance to practice discipline skills such as waiting patiently, remaining quiet, and offering support, encouragement, and applause for performers. Mingling with cast members after a show adds to the moment for children as well, and many Richmond-area theatres work this into their productions for kids and families. Interacting with people of varying backgrounds, whether it is a character portrayed in a play or the actors themselves, can broaden a child’s worldview exponentially. “Viewing various stories and characters helps expand your cultural universe,” Miller says. And you probably know this by now, but you don’t need to travel to New York City to see a Broadway-caliber show. The Sound of Music and Finding Neverland are part of the Broadway in Richmond lineup for the 2017-18 season, or you can see Mary Poppins at Virginia Rep’s November Theatre this holiday. If you want to travel a little further for a show, there is also Chrysler Hall in Norfolk (we saw Elf there last Christmas), the Modell Performing Arts Center at the Lyric in Baltimore, and the John F. Kennedy Center for the Performing Arts in Washington, D.C. A few years ago, we traveled to D.C. and made a day of it to see Elephant and Piggie’s We Are in a Play, based on the popular book series by Mo Willems. 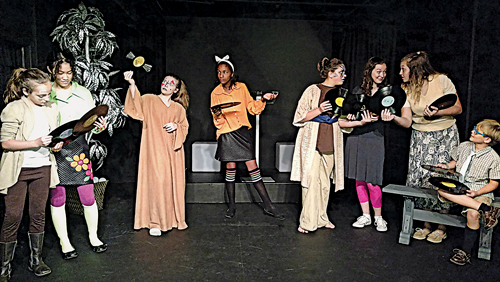 Virginia Rep’s Children’s Theatre is renowned for its productions. Whether you are looking to take in a drama, comedy, or musical with your family, you can find out beforehand what shows are appropriate for kids. Check the theatre’s website or call for guidance on length of a performance, content, and age recommendations. If the website isn’t as helpful as you’d like, families can usually search online for reviews in Richmond from RFM and other media outlets. Reading a popular show’s review from other markets can also be beneficial for parents. You might also look for live shows at non-traditional venues, like libraries and area malls. SPARC’s cast performed James and the Giant Peach, Jr. at Regency Square Mall in July. Families in attendance enjoyed a free show and the flexibility to move along if the kids weren’t into it. Community performances like these are also a good test-run to see if your children are prepared to last an entire show (for which you have paid a fair amount of money!). As children settle into elementary school, most are able to sit through longer productions and full-length shows geared to the family. Slowly building up to a lengthier performance will help children achieve a longer attention span, which will serve them well into adulthood. “It is so important to expose your child to the longer performances when they are ready,” Miller says. For little ones, Bialet suggests involving your child in the whole process whenever possible. No matter when or how you decide to allow your children to join you at the theatre, the key is to have fun and enjoy the family outing. Previous articleDown to Business in the City!